Logs will help you track and diagnose errors that may occur in the process of configuring and using the program. 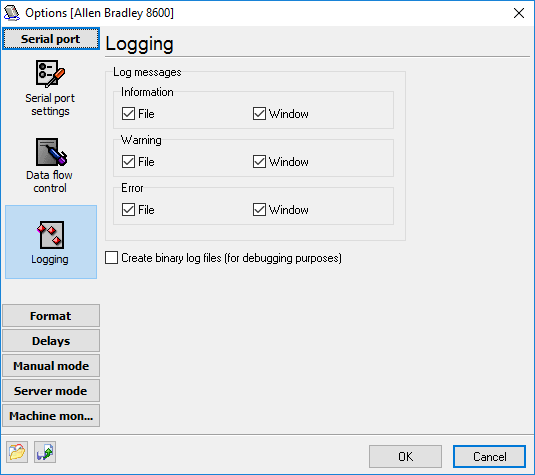 To configure the log settings, you should switch to the "Port/Log files" tab in the options window (fig.1). 2. Message log files – when the program is working, there may appear both simple informational and error or warning messages. You can configure the level of details in message logs for each machine. The log file either can never be changed or it can be created each day/hour/month which makes it easier to search for certain information in a log file by date. For each log file type you can specify folder, where all files will store.